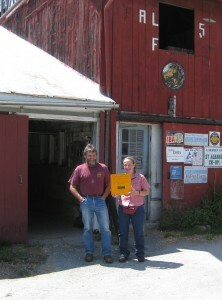 Larry and I both grew up on small dairy farms in central Massachusetts during the late â€˜50s and early â€˜60s.Â We were the proverbial â€œbaby boomersâ€.Â Â Our small home towns that once were made up of dairy, poultry and vegetable farms were rapidly becoming bedroom communities for the employees of several new manufacturing companies springing-up in the area. 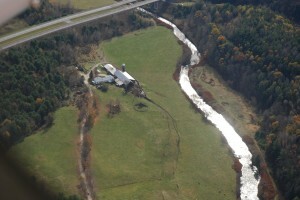 The newly conserved Al-Len Farm as seen from the air. Photo credti: Peter Kimball (editor of The Bridge Weekly ShoCase). The pilot was Winston Currier. 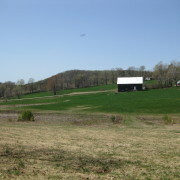 As kids we were helpless to keep the fields and woods that we knew so well from being sub-divided into house lots.Â We knew the farming economy was not the best—weâ€™d hear about it at the dinner table!Â Property taxes were rising and it sometimes seemed the only way for a farmer to pay the taxes was to sell off house lots each year. It wasnâ€™t only the house lots that were selling but even more land was being purchased by speculators to build a new kind of monstrosityâ€”the shopping mall!Â As more people were moving in to our area the local schools were not big enough to accommodate all the new children.Â More land was needed to build schools.Â Thus began the rise of the regional school system where several towns would pool tax money and matching federal monies to build an even larger school to accommodate the children from a group of bordering towns. One by one the farms we knew and loved were being gobbled up by the building boom.Â We wondered where all these people were going to get their food if all the farms were being cut up and paved over. My God parentâ€™s farm was one of the first to succumb to the development craze.Â It was land that had seen their blood sweat and tears as they struggled through the decades to build up the soil and open up old springs to bring water to the cows at pasture as they bred and raised a fine herd of Holsteins.Â The farm had provided them a good living but it was time for them to retire.Â I was just entering high school at the time and planned to go to college to study dairy science.Â If only they could hang on until then I would buy the farm and keep it going.Â I pleaded with them.Â Surely as a girl of thirteen they couldnâ€™t imagine I would be serious.Â I was just a kid with a dream.Â I couldnâ€™t blame them for not putting their lives on hold and trusting the gut feelings of a young teenager. For Larry it was much the same.Â Â The farm where he and his siblings, parents and grandparents lived and farmed was near a major east/west highway.Â There was enormous pressure on those farmers to sell tracts of land for the new electronics companies to build their manufacturing plants along that thoroughfare. 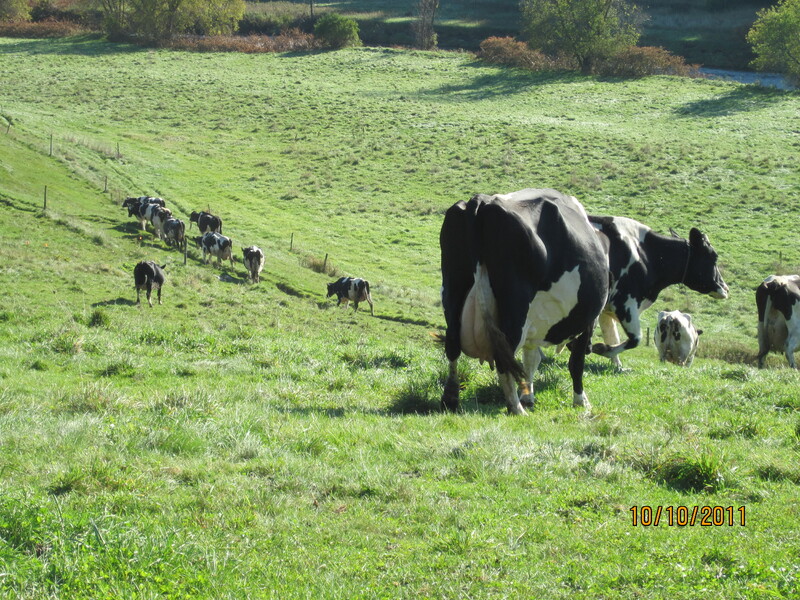 Although Larry and I didnâ€™t meet until many years later our individual responses to land development were the same.Â We each had vowed to ourselves that when we were old enough and had our own farms we would NEVER let our fields and woodlands be carved up and paved over. 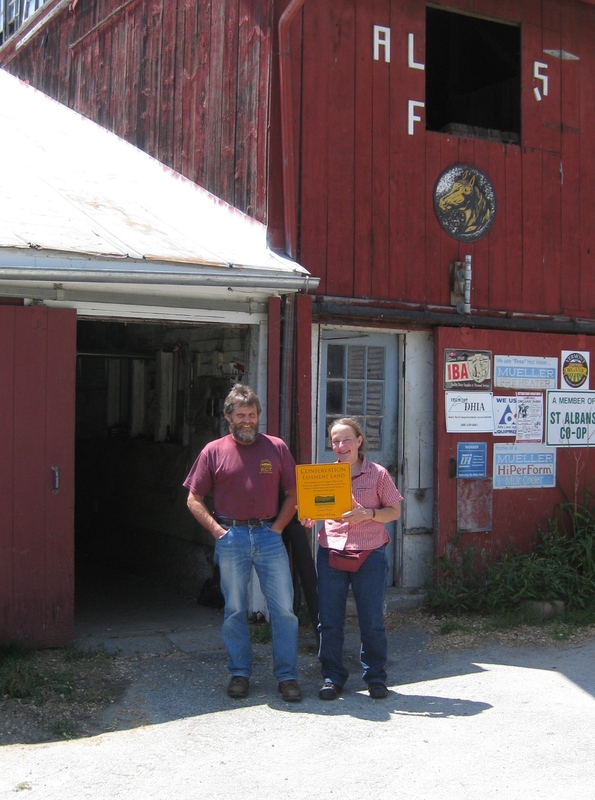 Twenty years later we were able to buy our own farm after having rented other farms for sixteen years.Â It would take the next twenty-three years to finally realize our mutual goals of farm, forest and land conservation! As of August 2, 2012 our 62-acre certified organic dairy farm along the Wells River in Newbury and Ryegate is now secured with a Conservation Easement with the Option to Purchase at Agricultural Value. 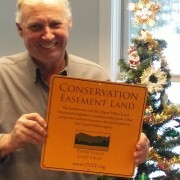 Larry and Alice Allen stand in front of their barn with a UVLT ‘Conservation Easement Land’ sign which will be placed on their property to exhibit it’s protected status. 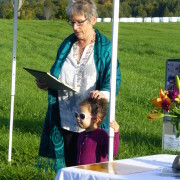 There are dozens of dedicated people who have helped make this possible.Â Upper Valley Land Trust has lead the way and stayed true to their mission despite numerous setbacks along the way.Â Vermont Housing and Conservation Board staff, Vermont Agency of Agriculture, Natural Resources Conservation Service both the Vermont offices as well as the Washington, D.C. offices, Vermont Land Trust staff, the Fifteen-Mile-Falls Mitigation and Enhancement Fund, Jenny Nelson of US Senator Bernie Sandersâ€™ office and many, many others including Vermontâ€™s preeminent agricultural land appraiser Daniel Berna. To all of the above-mentioned and others whom we have met along this journey we are deeply grateful for your professionalism and your tenacity to conserve this wee farm along the Wells River. 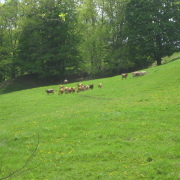 Voice Your Support of the Vermont Housing & Conservation Board!